As I put together my shopping checklist last Saturday, I realized most of the goods I was planning on buying were frequent repeats on my list. So I thought to myself: "What is it about these products that keeps driving me to known aisles of the store and why do I continuously find the same items in my cart?" My buying pattern became apparent soon enough; product packaging was playing a gigantic role in the balance between goods I wanted and those I needed. Advancements in resealability for shredded cheese is a classic packaging innovation example. 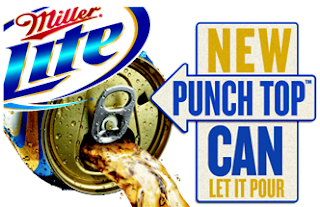 It is too early to tell whether the "Punch Top" is the future or a passing fad like the Vortex bottle. Clearly, the packaging made me do it. I can recall many instances, similar to Miller Coor's new Punch Top™ can, in which I have chosen merchandise over the competitive set simply because the packaging concept was interesting or worth experimenting with. Every package at a retail store has a unique blend of characteristics, including functionality, realistic image, design aspect, and aesthetic look and feel. If you're anything like me, then the outlook for the packaging industry seems promising considering all the new innovations that have demonstrated success in the marketplace today! Have any package innovations changed your buying patterns? Leave a comment to tell us about it!